Maritzburg United has signed a two year contract ( with an option to renew) with Zimbabwean International Striker, Evans Rusike. He has made four appearances for the senior national team, and scored eight goals for his former team Hwange FC last season. 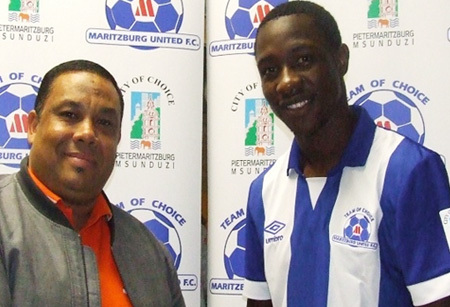 The Team of Choice released a number of players at the end of last season, including Terrance Mandaza who did striking duties for United for several seasons. Rusike comes in as a fresh replacement for fellow countryman Mandaza and joins another homeboy Khumbulani Banda. “Banda and i know each other well and we have played against each other. It’s great that we are now team mates”, he said. Speaking to the Communications Manager Brian Zuma, Rusike was in good spirits. When asked what the United fans can expect from him, the tall striker quipped, “I am here to do a job. I am going to make them (fans) happy." Evans joined the Zimbabwe Premier League outfit Hwange in 2012, which was when he started his professional career. Maritzburg United has signed a two year contract (with an option to renew) with Zimbabwean International Striker, Evans Rusike. United beat AmaZulu to make history!